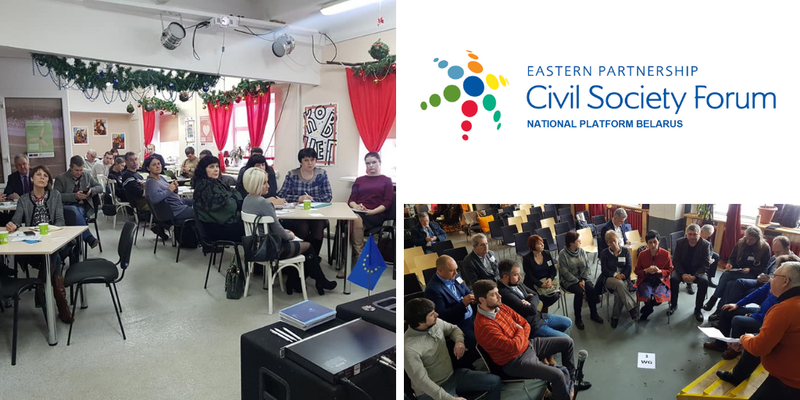 On 26 January 2019, Eastern Partnership Civil Society Forum (EaP CSF) Belarusian National Platform reconvened in Minsk to address its strategy for 2019-2021 and other priorities for the coming years. This year’s conference dealt with civil society’s role in promoting public interest – and engaging with policy-makers, using the different mechanisms available. Apart from discussing recent concerns and the current situation in the country, the organisations participating in the conference had a chance to learn from their Armenian and Georgian colleagues, invited especially for the event. The priority is to improve the environment in which the civil society operates in, we can read in the adopted resolution. At the moment, “there is no objective description and assessment of the current state of the environment for civil society, as well as desired areas and criteria for its improvement” within the framework of 2020 Deliverables. The document goes on to say civil society is able to contribute in this respect, and work towards an “appropriate Roadmap or National Action Plan“. It calls upon the Republic of Belarus to participate in the process – and make political, legal and other, general provisions which would ensure civil society is perceived as a legitimate actor and stakeholder. The recommendations for the authorities are clear: CSOs – civil society organisations must operate freely and without interference from the state. Both registered CSOs and informal, civic initiatives should be able to function legally, without unnecessary bureaucratic burden and be able to access foreign funding. The list also touches on censorship and media environment: without “pluralism and meaningful criticism”, it is impossible to establish the “standard and mandatory process of public dialogue”. This is different to the situation where certain media “exploit hate speech”, and propagate “negative stereotypes about CSOs”. Other key documents adopted at the conference include a resolution, calling to halt the works at the Ostrovets Nuclear Power Plant – and a civil society response to the “escalation of threats to the independence of Belarus“. In this regard, there are no circumstances “that can serve as grounds for the deprivation of Belarus of sovereignty or its inherent parts“, a principle that also applies to citizenship and individual rights of Belarusian citizens.